We’re already a quarter of the way through 2019. How do we stop this wheel of life stop turning so quickly? One way to slow it down a little is to grab your favourite drink, kick off your shoes, and sit down and spend a few lazy hours reading this exciting first issue of Wildside for 2019. 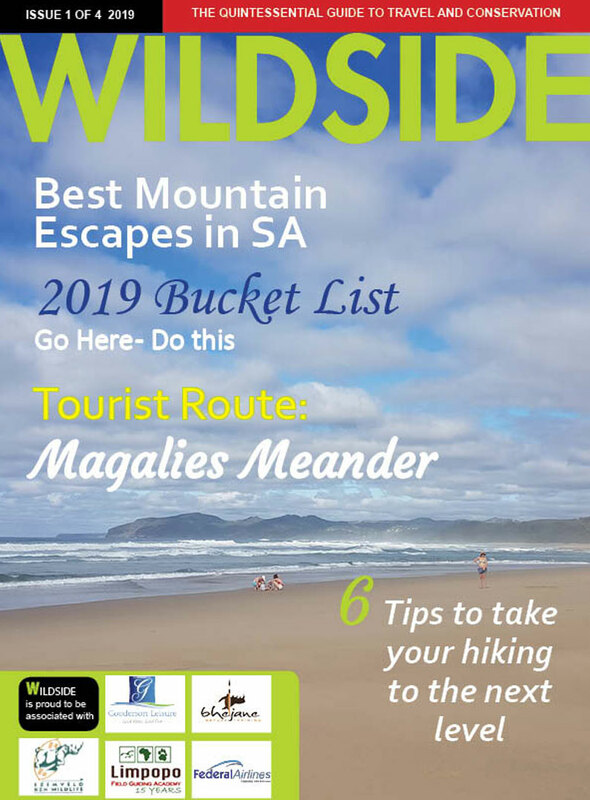 In this edition, we explore the Magalies Meander, introduce you to a few of the best mountain escapes South Africa has to offer and we give you our 2019 Bucket List destinations and experiences. We also visit Jock Safari Lodge and Umngazi River Bungalows. We launch our new Wildside Rewards Club which gives members subscription to Wildside, exclusive members only competitions and various travel discounts. As the year progresses we hope to be able to add many more benefits for our members – we’ll keep you informed via the website. Subscribing to our magazine automatically gives you access to membership content on our website! **Shipping note: Hard Copy rates include standard SA Postal charges. Hard Copies being shipped outside of South Africa will be subject to additional international postal charges to be determined upon confirmation of purchase. Please contact info@wildsidesa.co.za for international postal costs.